When Germany invaded Poland on September 1, 1939, the army ordnance office (HWA) devised a program to explore the possible development of nuclear weapons. The first meeting was organised by Kurt Diebner, a nuclear physicist who advised the HWA, and was held on September 16, 1939. The second meeting drew in major players like Klaus Clusius, Otto Hahn, Werner Heisenberg, and was held on September 26, 1939. Before the year was out, Diebner had assembled a fairly large team of scientists, formed a consensus on what goals they should pursue, and organised everyone into teams to carry out theoretical and applied research. Within Germany, the nuclear program was known as the Uranverein. They made alot of progress early on in the war, and were actually ahead of the British and Americans until early 1942 or so. From that point on, though, the Americans began to rapidly outpace them with the Manhattan project and the huge resources marshaled toward it. While Germany eventually lost the war and any hope of winning the nuclear race, the achievements made by their scientists were considerable. The scientists encountered numerous difficultys, most notable of which was when the HWA relinquished control of the project in July 1942. Almost as bad was when the allys began their strategic bombing campaign, which resulted in some of the laboratorys being destroyed. In spite of all this, the Germans dilligently continued their work and maintained a strong research program. This was especially true for the team run by Paul Harteck, as we will eventually see. At the time, there were known to be just two approaches to weaponizing the strong nuclear force. The first method is to enrich natural uranium by separating U-235 from U-238. The U-235 isotope is fissile, but makes up only 0.72% of natural uranium by mass. If uranium is to be used in a bomb, its U-235 concentration must be raised to 90%. The second method is to bombard natural uranium with neutrons and transmute it into plutonium. The U-238 isotope is fertile, and if it captures a neutron, it will turn into U-239, which then decays into Pu-239. If plutonium is to be used in a bomb, its Pu-239 concentration must be raised to 93%. Uranium can be enriched to weapons grade by a variety of techniques, but uranium can only be transmuted into plutonium by a reactor. In hindsight, the German nuclear program made significant steps towards uranium enrichment, but were lagging in their efforts to make a reactor. The details of this subject are complicated and sometimes convoluted, since many historians have offered many appraisals that are mutually exclusive. Authors like Samuel Goudsmit (of ALSOS fame) have such a prejudice against the nazis that it interferes with their ability to even tell a coherent narrative. Other writers go in completely the opposite direction, and try to credit the Germans with all kinds of specious achievements. As always, though, only some of these appraisals can be corroborated. This article will focus on a number of myths about the German nuclear program and how it measured up to the Manhattan project. The Uranverein was never able to develop an effective means of enriching uranium to weapons grade. This is simply not true. Early in 1943, the research team under Paul Harteck had created a centrifuge of novel design, subdivided into multiple rotors and multiple chambers. This 'ultracentrifuge' was tested by separating isotopes of xenon gas, and then by separating uranium hexafluoride. This machine was able to enrich several grams of uranium to 7%, good enough to warrant funding from the Reich research council (RFR). More centrifuges were made, and the design was constantly tinkered with. By May of 1944, a company in Freiburg had built and successfully tested the MK III ultracentrifuge, which persuaded Harteck to move his laboratory there. The team set up a facility in the nearby town of Kandern, where a few centrifuges were assembled into a cascade. After a few months, however, allied bombings forced them to stop work and relocate to a town called Celle. Early in 1945, the facility only had 20 or so of these machines, but was still enriching 50 grams of uranium to 15% each day! The MK III ultracentrifuge was a technological marvel with a performance far exceeding the american centrifuges. There were actually plans to put it into mass production, but the war ended before this could take place. Other research teams in germany had experienced similar ups and downs. 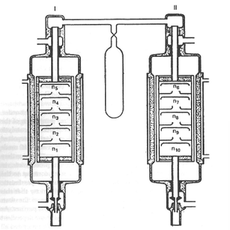 By June of 1943, Erich Bagge had created an 'isotope-sluice' machine that ran uranium hexafluoride through two shutters revolving at high speed, allowing the lighter U-235 to be separated. This was a totally novel approach which never occurred to the Americans, using a combination of electromagnetism, centrifugal force, and thermal diffusion. While his first two prototypes were destroyed by air raids, Bagge was able to relocate to Butzbach and set up another machine. By July of 1944, the 'isotope-sluice' had undergone an endurance test lasting 120 hours, yielding several grams of much enriched uranium. The models indicated its efficiency could be greatly increased. At around this same time, Manfred von Ardenne was testing a magnetic isotope separator, not unlike the calutrons used at the Y-12 plant at oak ridge. 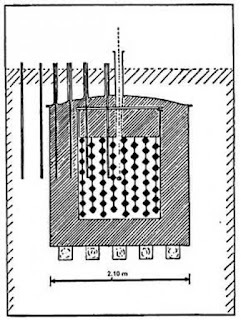 Both machines used magnetic fields to deflect charged particles and separate them based on differences in mass, but the German design used an ion source to sublimate the uranium. This greatly increased its enrichment capacity. Ardennes laboratory was located underground in his manor, which protected it from air raids. And since he was financially supported by the post office, work on it was able to continue unimpeded. Fortunately for the allies, however, only one of these machines were made during the war. Putting the technical details aside for now, it should be clear that the Uranverein had made major strides in their knowledge and ability to separate U-235 from U-238. The problem was that these efforts were all confined to laboratorys, and were never expanded to the industrial scale that was needed for an atom bomb. There were not enough scientists and engineers working on uranium enrichment, and there was not enough funding from the RRC to produce these machines in anywhere near the numbers required. The only team that came close was the one run by Harteck. German scientists were never able to achieve a self-sustaining nuclear reaction, much less a working reactor. Diebner had proven that uranium cubes were superior to the plates that Heisenberg used, and that the aluminum containment vessels were completely unsuitable. While the basic research problems had been overcome, no new reactors could be built without an adequate supply of heavy water. Progress on this area stalled as a consequence, and results came at an agonisingly slow pace. Conditions were only worsened when the allys conducted raids against the Norsk hydro plant, interrupting the supply of heavy water. The months and years dragged on, and optimism soon gave way to pessimism. By the spring of 1944, Heisenbergs team in Berlin finally went forward with the B-VI experiment, which had been delayed for roughly a year due to the bombings. After many months of testing and altering the layout of their uranium pile, they were unable to yield significantly higher results than Diebner. Thus, Heisenberg was forced to admit the inferiority of the plates, and to use a carbon reflector instead of light water. By the winter of 1944, they had no choice but to move their equipment to Haigerloch to avoid the relentless air raids. Diebners team had already evacuated from Gottow to Stadtilm for the same reason. By this time, they were carrying out the G-IV test which yielded the highest neutron increase of any German reactor. Diebner was elated with the results, later claiming that his pile had briefly went critical. In the spring of 1945, Heisenbergs team began their final experiment of the war. The B-VIII pile also obtained a high result: For every 100 neutrons injected into the pile, 670 neutrons were emitted at the surface. This was a very significant achievement, but it wasn't quite enough for a self sustaining reaction. The German reactors were very unsafe, basically an accident waiting to happen: They had no control rods, and no way to stop a meltdown from taking place. 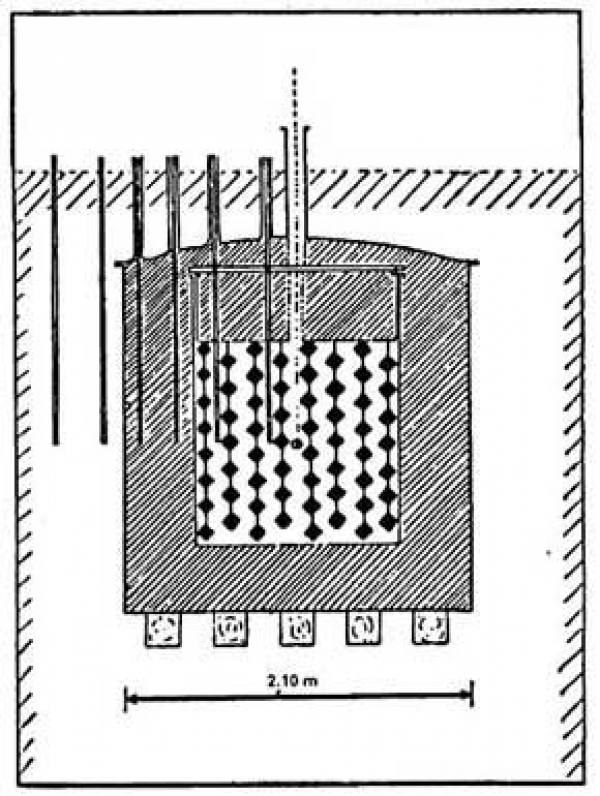 The Uranverein never measured the fission cross section of uranium-235: Hence, they were never able to properly estimate the critical mass for an atomic bomb. That isn't supported by the facts. 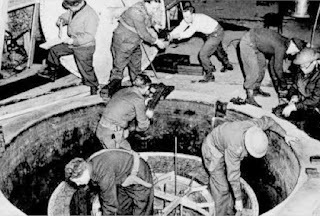 After the conquest of Denmark and France in mid 1940 (among other unfortunate victims of the blitzkrieg), Germany had access to cyclotrons at Vienna, Copenhagen, and Paris. These are a type of particle accelerator that can generate 'fast neutrons', and thus allow scientists to measure the fission cross section of an element. Each of the laboratorys in Vienna, Copenhagen, and Paris were visited by German teams during the war. This is unsurprising, because determining the critical mass of U-235 was a key parameter for which much of their work would hinge on. The scientists made fission cross section estimates at three points in the war, each more accurate than the last. In August of 1941, an individual named Fritz Houtermanns (who was employed in the laboratory of Manfred von Ardenne) wrote a paper which discussed runaway chain reactions and the possibility of transmuting uranium into plutonium. This paper was circulated among members of the uranverein, eliciting a flurry of discussion. By February 1942, the HWA team had published a document outlining the critical mass for a U-235 bomb: The estimate was 10 to 100 kilograms. This was comparable to the estimate made by the NAS team in america, back in November of 1941. The baseless claims about the German scientists being unable to do these basic experiments were promulgated by authors like Samuel Goudsmit after the war, who despised the men for their deeds during the war. After the destruction of the Norsk hydro plant in 1943, the germans were unable to produce heavy water, and were forced to rely on their existing stocks. First off, the Norsk hydro plant was never fully destroyed. After the bomb raid of 1943, it was actually disassembled and shipped to Germany. Second, the scientists involved were always aware of the dangers of relying exclusively on one source of supply. That is why they set up four different plants over the course of the war. They even invented new hydrolytic techniques to produce more deuterium oxide at a lower price, which were eventually used in these facilitys. The first was the Leuna plant, south of Merseberg, which used the Harteck/Suess process (and was codenamed Stalins organ). The second was the Kiel plant using Dr Geibs hydrogen sulphide exchange process. Then the Hamburg plant, which used the Harteck low pressure distilation process. And finally, there was the Munich plant using the Clusius-Linde process. The west didn't learn about the existence of these facilitys until long after the wars end. The ALSOS mission by Samuel Goudsmit only ever knew about one of them: The Leuna plant run by IG farben, which was destroyed in a bomb raid on July 28, 1944. This was one of the reasons they underestimated the progress made by the uranverein. Although to be fair, funding for the centrifuge research was cancelled in 1943. Its possible that the Americans could have come up with a design that was as good as that of the Germans, but they never got the opportunity to do so. There were quite a few more tests after the L-IV experiment: There was the G-II to G-IV tests in Gottow, along with the B-VI to B-VIII in Berlin. Other teams may have carried out their own uranium pile experiments, as well. In fact, the German reactors were more safe than the Chicago pile tested by Enrico Fermi in 1942. The reason for this is that heavy water is a more effective moderator than graphite, which means their design used much less uranium to generate a chain reaction. Fritz Houtermans used radium to make the 'slow neutron' measurements in 1941. Walther Bothe used the Paris cyclotron to do the fast neutron measurements in 1942. Jentschke and Lintner used the Vienna cyclotron to do more fast neutron measurements in 1943. The Virus House: Nazi Germany's Atomic Research and the Allied Countermeasures, by David Irving. German National Socialism and the Quest for Nuclear Power: 1939-49, by Mark Walker. Heavy Water and the Wartime Race for Nuclear Energy, by Per F. Dahl. Hitler's Nuclear Weapons, by Geoffrey Brooks.